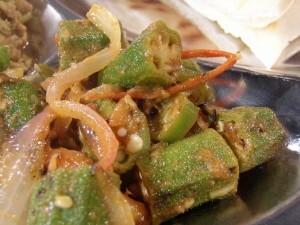 Achari Bhindi recipe by bestchefs at DesiRecipes.com. Then add sliced onions and let it cook until onion become tender Donot golden brown it.Then add ginger garlic paste and saute' it. Then add okras cutted and cook it until You see okras are covered with all of masala and are little tender.Then add tamarind water and khatai powder with red crushed pepper and mix it really well. On really low heat let the okras cook until all sliminess is gone and they are cooked If needed add more water .You have to completely cook okras. It take 15 to 20 mins to okras get completely cooked.Serve hot with chapati.